America is the ancestral home of the burger, so I had to have at least one during my recent trip to Las Vegas. Ironically though I ended up at the Burger Bar at the Mandalay Bay Hotel which was established by Hubert Keller, a French haute cuisine chef responsible for a completely different eatery at the same hotel, Fleur. This rather unusual background means that despite its sports bar appearance, complete with booths that have their own miniature TV screens showing matches and games, it is possible to spend a fair chunk of money at the Burger Bar. The $60 Rossini burger uses kobe beef, sautéed foie gras and shaved truffles but I opted for a more affordable version using just the kobe beef. It may have been a poor man’s alternative at just a third of the price but it wasn’t lacking in taste. The reasonably-sized patty, cooked medium rare as recommended, is very tender and succulent with a mildly coarse grind and a slight nuttiness to it. It was unevenly seasoned though with one half saltier than the other while the toppings of lettuce, tomato and red onion were functional at best and sauces are applied at your discretion. The grilled, slightly crisp bun held everything together well and you have the choice of several different buns. I opted for the version with flecks of embedded onion. Although it’s not quite as good as Hawksmoor’s burgers, it’s not far off. It may look humble, but this is a fine burger. I was tempted to pair the kobe burger with the intriguing sounding buttermilk onion rings, but as I was flying out shortly after the meal I decided not to weigh myself down too much with carbohydrates. Plus I was saving room for dessert. 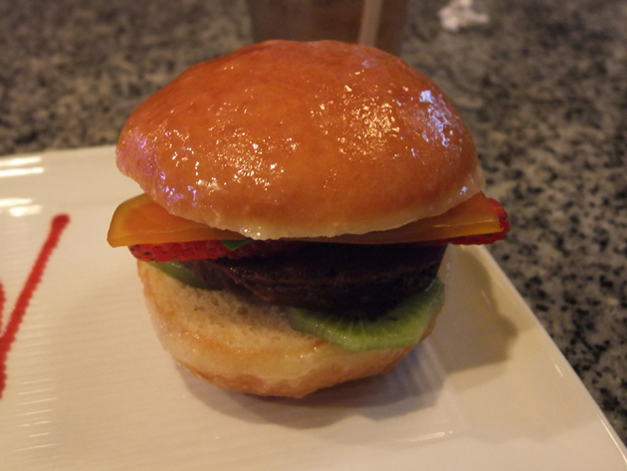 I opted for one of the three dessert burgers, a dessert cleverly made to appear like a hamburger. Here the buns were actually a glazed doughnut sliced in half, while the meat patty was actually an almond chocolate ganache. The cheese was a slice of orange-flavoured jelly, the ketchup was slices of strawberry and the lettuce was actually mint leaf and slices of kiwi fruit. Sadly the glazed doughnut and almond chocolate ganache were deeply unremarkable and were so generic in taste and texture that they could have been plucked off a supermarket shelf. The fruity components were nice, but then you’d have to try really hard to screw up fruit. Still, if you’re inexplicably staying in Vegas with kids then a dessert burger would probably keep them entertained, at least for a little while. Iced tea is one of the American drinks I miss most living in London. That may be a case of nostalgia clouding my memories though if the Burger Bar’s weak excuse for iced tea is any indication. The raspberry-flavoured variety I ordered tasted like the result of someone accidentally spilling some raspberry-flavoured yogurt into a particularly weakly brewed glass of iced tea. Poor. The Burger Bar can definitely serve up a quality burger, although the ambitious desserts are interesting conceptually but are humdrum in their execution. Still, it’s definitely a place worth trying if you want a break from some of the more elaborate meals available in Las Vegas. Opening Hours: Sunday-Thursday 11.00-23.00, Friday-Saturday 11.00-01.00. 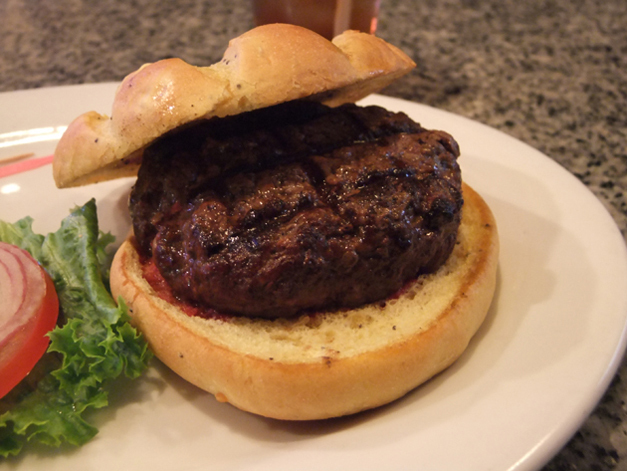 Tags: beef burger, burger bar, hamburger, hubert keller, las vegas, restaurant, review. Bookmark the permalink.